"Bitumen is a black, oily, viscous material that is a naturally-occurring organic byproduct of decomposed organic materials. Also known as asphalt or tar, bitumen was mixed with other materials throughout prehistory and throughout the world for use as a sealant, adhesive, building mortar, incense, and decorative application on pots, buildings, or human skin. The material was also useful in waterproofing canoes and other water transport, and in the mummification process toward the end of the New Kingdom of ancient Egypt. It is also flammable. And, thanks to recent scholarship, this gooey stuff is also identifiable to source. The earliest known use of bitumen was by Neanderthals, some 40,000 years ago..... During the late Uruk and Chalcolithic periods at Hacinebi, in Syria, bitumen was used for construction of buildings and water proofing of reed boats, with among other uses. Natural asphalt (or bitumen) deposits, oil seepage and liquid oil shows are widespread in the Middle East, especially in the Zagros mountains of Iran. Ancient people from northern Iraq, south-west Iran and the Dead Sea area extensively used this ubiquitous natural resource until the Neolithic period (7000 to 6000 BC). "The ancient Arabian people known as the Nabataeans were already engaged in the petroleum business when, in 312 BC, a Greek army led by a general called Hieronymus crossed the Syrian desert into present-day Jordan and headed toward the southern tip of the Dead Sea. As the troops reached their destination, Hieronymus couldn't believe his eyes! He saw scores of Arabic-speaking tribesmen camped on the shore, with their pack-camels and reed rafts. All were waiting for the thawr—Arabic for "bull"—to appear in the middle of the waters. The "bulls," Hieronymus discovered, were iceberg-like mounds of bitumen—or naturally occurring asphalt—that floated up from the depths of the water. Every time a new "bull" rose into sight, a swarm of axe-wielding seamen leapt onto the rafts and began a frantic race toward the mound. When they arrived at the “bull,” they jumped on it, cut off pieces and put them on the raft. Back on land, they loaded the bitumen onto camels. 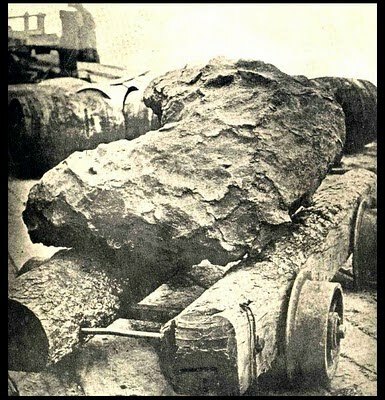 The destination was Alexandria, a major seaport in Egypt...."
"Obsidian is the result of volcanic lava coming in contact with water. Often the lava pours into a lake or ocean and is cooled quickly. 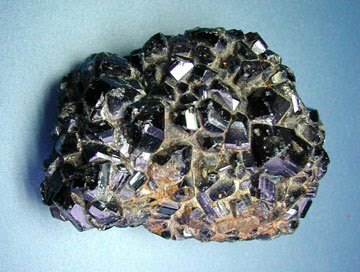 This process produces a glassy texture in the resulting rock. Iron and magnesium give the obsidian a dark green to black color. Obsidian has been used by ancient people as a cutting tool, for weapons, and for ceremonial purposes. It was an important part of the Olmec Culture. It is also an invaluable tool for archaeologists because it's source and date can be determined." This following paper outlines obsidian industries of Anatolia during the neolithic. As early as 5500 B.C. people in Melanesia were voyaging in boats and trading in obsidian. The eastward movement of people continued until Tahiti and the Marquesas Islands were reached, at least by A.D. 300. 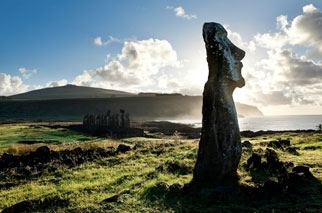 Voyaging canoes moved east, north, and south to ultimately inhabit Easter Island, Hawaii, and New Zealand, respectively, all in the short period of about 400 years. "Map of Southeast Asia and Australia, with present and Ice Age land-sea boundaries, shows the importance of seafaring in this region. 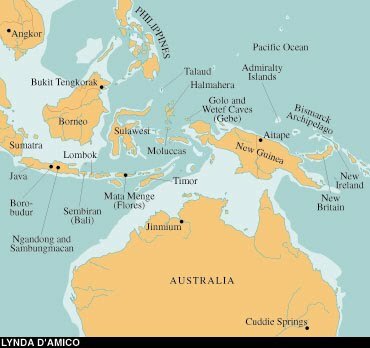 Possible routes for the colonization of Australia by modern humans are north, through Sulawesi, and south, crossing from Timor. By 1000 B.C. obsidian from New Britain was reaching Borneo." The following articles go into more depth about obsidian trade and why it is such a useful tool for archaeologists. "The author discusses the archaeological evidence for an Aegean Minoan maritime colonization of southeastern Iberia. The primary causal factor for this was the development of the alloying technology of arsenical copper. The alloy's hardness and castability made the woodworking tools of the saw, bow drill, and lathe possible. These tools set the stage for the invention of the first efficiently produced planked wooden ships with keels in the Aegean that set out on voyages of exploration early in the 4th Millennia B.C. in search of the prestige metals of gold and silver resulting in the Los Millares culture in southeastern Spain." "Ever since man discovered, in the 6th millennium BCE, how to turn a piece of rock into malleable metal, copper has been mined and smelted in the Timna Valley........The earliest, well-preserved copper smelting furnace dates from the 5th millennium BCE. It consisted of a small pit dug in the ground, with a low substructure of field stones, and was ventilated by goatskin bellows." "Most of the drawings in this cluster are of animals (Ibex, Oryx, ostrich, snake and dogs), as well as hunters and soldiers (holding bows and arrows). There are two types of men depicted by these drawings: armed Egyptian soldiers, and mining workers and hunters that came from nearby Midian (in Arabia). These engravings were created by sharp points and some lines used to have colored paints (light grey and red)." "Mysterious prehistoric stone buildings, dating back to the Copper Stone Age (4000-3150 BC), which are only found in South Sinai, in several areas..."
“Copper mining and smelting is a hallmark of early state-level society in the eastern Mediterranean,” says Savage, a researcher from Arizona State University. His team is uncovering evidence for sophisticated economic and political activity in the valley about 3,000 years ago. 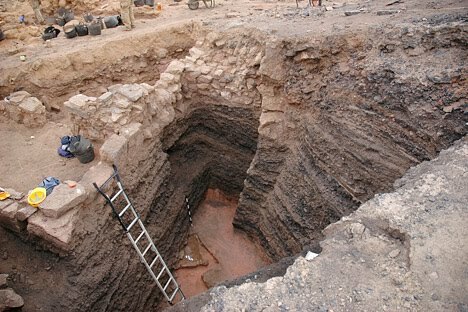 A slag mound at Khirbat en-Nahas provides evidence for organized, large-scale copper mining and smelting in the Jordanian desert about 3,000 years ago. The copper slag is piled in black layers under a building some 100 years newer than the heap. Old Copper Complex is a term used for ancient Native North American societies known to have been heavily involved in the utilization of copper for weaponry and tools. It is to be distinguished from the Copper Age (Chalcolithic era), when copper use becomes systematic. The Old Copper Complex of the Western Great Lakes is the best known of these. Great Lakes natives of the Archaic tradition located 99% pure copper in the area of Lake Superior, both in veins and nuggets in gravel beds. Eventually they learned to hammer the copper and produce a variety of spearpoints, tools and decorative objects. In addition to practical use, the Copper Complex peoples traded copper goods to obtain other exotic materials. The Copper Complex can be dated as far back as 6,000 years. By about 3,000 years ago the use of copper is increasingly restricted to jewelry and other status-related items, rather than for tools. This is thought to represent the development of more complex hierarchical cultures in the area. in a pit dug by prehistoric Indians on Copper Island. At a time when geographical knowledge of the West was still scanty, and when the secrets of the tin-trade were still successfully guarded by the seamen of Gades and others who dealt in the metal, the Greeks knew only that tin came to them by sea from the far West, and the idea of tin-producing islands easily arose. Later, when the West was better explored, it was found that tin actually came from two regions: Northwest Iberia and Cornwall. Diodorus reports: "For there are many mines of tin in the country above Lusitania and on the islets which lie off Iberia out in the ocean and are called because of that fact the Cassiterides." According to Diodorus tin also came from Britannia to Gaul..."
After about 3500 BC, there was increasing use of several metals in Mesopotamia, not just copper and lead. Gold and silver were exploited as native metals. Silver was extracted from lead ores, possibly first as a by-product of lead, then as a desirable commodity in its own right. Bronze appeared in the region about 3000 BC. Metal began to play a part in international relations, especially during Akkadian times (2350­2200 BC). About 2350 BC Sargon of Akkad invaded Anatolia from his lowland base. He set up a short-lived empire of secure trade routes, and he boasts that a single caravan carried about 12 tonnes of tin, enough to make 125 tonnes of bronze‹and to equip a large army. "....Stone age man learned to fashion gold into jewelry and ornaments, learning that it could be formed into sheets and wires easily. However, its malleability, which allows it to be formed into very thin sheet (0.000005 inches), ensures that it has no utilitarian value and early uses were only decorative. As gold is a noble metal, being virtually noncorrosive and tarnish free, it served this purpose admirably.... due to mankind's fascination with its color, have lead to gold being the one of the more important metals in daily life." Alluvial placers are those formed in present and past watercourses in gulches, creeks, rivers, flood plains and deltas....Alluvial placers have been worked since ancient times in practically every country and have produced probably about one-quarter of man's store of gold. If we include the Witwatersrand deposits as fossil alluvial placers, the amount of gold produced from these types of placers probably approaches two-thirds of man's store of the precious metal. "As we developed the gold-working hypothesis at Hosh el-Guruf, some members of our team began excavating a contemporaneous cemetery site at Al-Widay, next to the village where we were staying, which was a two-hour drive from the nearest paved road. The villagers not only worked for the excavation, but provided fresh bread daily, delivered water for washing and cooking, and showed us genuine hospitality. The cemetery at Al-Widay was interesting in part because it presumably contained the burials of the people who mined the gold at Hosh el-Guruf. When we returned to complete the excavation of more than 100 burials in the cemetery in the winter of 2008, we found the graves were simple pits with piles of stones on top of them. Each of the dead was buried with a standard set of three vessels--cup, bowl, and incense pot--and sometimes with additional pots and beads made of locally available carnelian, ostrich egg shell, or faience. This pattern turned out to be fairly typical of Kerma-period sites throughout the Fourth Cataract. One thing that was striking about the cemetery was the scarcity of gold--for a community that was connected to gold mining, those who lived there did not appear to have kept much of what they found. There was one burial with 101 tiny gold beads, made from a gold sheet that was rolled and cut into small rings; another contained a single gold bead. A number of the graves had been plundered in antiquity, perhaps by people looking for gold, but others were unlooted, and there was still very little gold in those burials. In fact, very little gold has been found in any of the Fourth Cataract excavations..."
"The far-flung origins of the exhibition's pieces underscore Afghanistan's ancient role as a cultural transmission point along the set of trade routes known as the Silk Road, said archaeologist and exhibition curator Fredrik T. Hiebert"
"At the same time, there were clearly imported items in the cemetery, such as Egyptian ceramics, scarabs, and some distinctive, polished, black-topped redware vessels with a gray band that were likely made in Kerma itself. One particularly interesting find was a scarab inscribed with the name of an Egyptian army officer, Nebsumenu, found in the burial of a young girl. We do not know how the scarab ended up in this remote area, but its presence raises questions about the connections between cultures at this time. One possibility is that Nebsumenu dropped his seal in battle or in flight from the fortress in which he served. The seal would have become part of the spoils taken by the army of Kush back to Kerma. 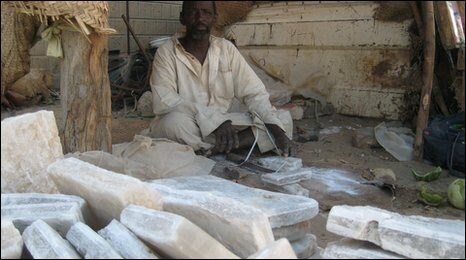 It could then have been sent by the king of Kush as a gift to a local leader in the Fourth Cataract. Another possibility is that Nebsumenu lost his seal to the Medjay, a well-known band of nomads, whose routes would have taken them to the Fourth Cataract region. In this scenario, the scarab would have been a symbol of success in battle. Our research seems to have illuminated two ends of an exchange network: gold moving from the Fourth Cataract to Kerma, and a small number of objects moving from Kerma to the Fourth Cataract. It appears to have been an unequal exchange: those at the center of the kingdom were hoarding wealth, while those at the periphery were exploited. But without direct evidence that the gold was moving from this site to Kerma, it remains a hypothesis that attests to the abundance of information that still lies beneath the rocky earth." "Gold mining in one form or another goes back into antiquity at least for more than 4000 years. During the earliest times one can imagine that the winning of gold was a haphazard activity, nuggets of the native metal being plucked from some auriferous stream, the oxidation zones of gold or sulphide deposits or from residuum near such deposits. Production was probably erratic and generally unorganized. By the time of the Pharaohs, however, organized gold mining in the Arabian and Egyptian shields appears to have been well established, and gold was seemingly relatively plentiful compared with silver for in the Code of Menes, the first pharaoh, who reigned in Egypt about 3500 B.C., it was decreed that "one part of gold is equal to two and one-half parts of silver in value"..In the Code of Menes, who reigned in Egypt about 3500 B.C., it was decreed, "one part of gold is equal to two and one-half parts of silver in value." By 1000 B.C. both gold and silver were probably in widespread use as coinage metals in all countries between the Indus and the Nile. Other uses for gold mentioned in old manuscripts from various civilizations include the fabrication of idols, shrines, altars, bowls, vases, flasks, drinking cups, funeral face masks, sarcophagi, mummy cases and ornamental weapons. The art and trade of the goldsmith and minter have, therefore, come down to us from antiquity....The process of 'parting' gold and silver by cementation with salt, whereby the silver is converted to chloride and the gold is run off, was apparently known in the 6th century B.C......Native gold is a relatively common mineral and is present in gold-quartz veins, in oxidized zones of many sulphide and other types of auriferous deposits and in placers in streams and rivers in most parts of the world......The mountain torrents are said to bring down gold, and these barbarians catch it in troughs perforated with holes and in fleecy skins." 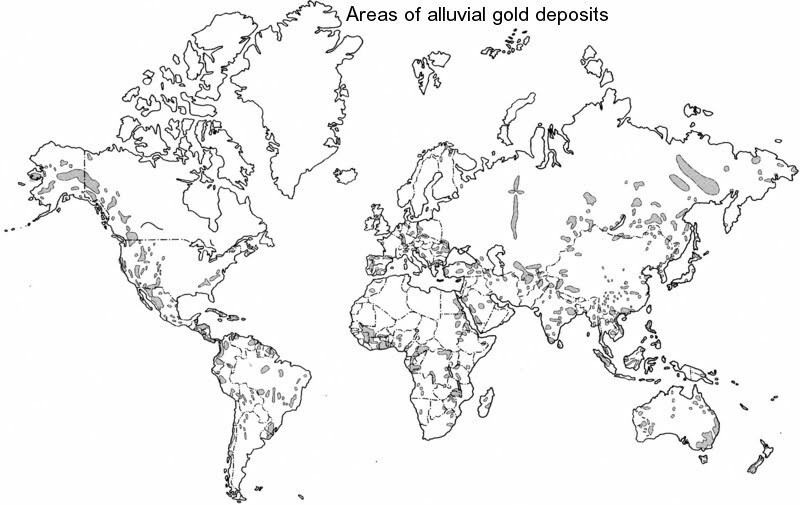 Gold has a widespread occurrence in practically every country in the world. In Europe, Asia and Africa ancient gold mines are known in Spain, Great Britain, Greece, Turkey, Saudi Arabia, Iran, India, China, Japan, Russia, Uzbekistan, Armenia and numerous other countries. Placers have yielded gold from the rivers Tagus, Guadalquiver, Tiber, Po, Rhone, Rhine, Hebrus (Maritsa), Nile, Zambezi, Niger, Senegal, Pactolus (Sarabat), Oxus (Amu Darya which flows through the golden land of Samarkand), Ganges, Lena, Aldan, Yangtze and hundreds of others too numerous to mention. The Egyptians mined gold extensively in Sinai, eastern Egypt and Sudan (Nubia) as far back as 4000 years ago. It was from them that the Persians, Greeks and Romans learned the techniques of gold prospecting, mining and metallurgy." "We have also the Greek myth of Jason and the Golden Fleece. According to this myth, the Golden Fleece was taken from the ram on which Phrixus and Helle escaped from being sacrificed. It was hung up in the grove of Ares in Colchis and recovered from King Aeetes by the Argonautic expedition under Jason, with the help of the sorceress Medea, the king's daughter. In actual fact the Argonauts were early prospectors who sought the source of the ancient placers on the Black Sea. At that time (1200 B.C.) the workers of auriferous placers recovered the gold by trapping the metallic particles on sheep's fleeces placed in crude sluices. The fleeces were then hung up to dry in nearby trees and were later shaken to collect the gold. The distribution of Taiwan nephrite artifacts in Southeast Asia. The green zone represents the currently known distribution of Taiwan nephrite artifacts. The green triangle locates the Fengtian nephrite deposit. Yellow stars represent sites outside Taiwan with positively identified Fengtian nephrite artifacts (Taiwan itself has >108 jade-bearing sites, and these cannot be shown individually). Jade is a general term for two types of tough rock — those made of jadeite jade and another group of nephrite jade. The stones are both greenish in color, but nephrite jade is slightly softer, while jadeite jade is scarcer, mostly found in cultures from Central America and Mexico before Europeans arrived. "In the Pacific, jadeite jade as ancient as this artifact is only known from Japan and its usage in Korea," study researcher George Harlow, of the American Museum of Natural History in New York, said in a statement. "It's never been described in the archaeological record of New Guinea." Researchers from American Museum of Natural History studied the artifact with X-ray micro-diffraction, which bounces a small beam of X-rays off the specimen in order to find its atomic structure, and in turn, the minerals within the rock. A rock's mineral composition varies depending on what chemicals are in the ground when it forms. The signatures are so specific researchers can sometimes pinpoint the origin of rocks. Surveying stone"When we first looked at this artifact, it was very clear that it didn't match much of anything that anyone knew about jadeite jade," Harlow said. The artifact's chemical composition "makes very little sense based on how we know these rocks form." The jadeite in the rock is different from the jadeite jades found in Japan and Korea at the time. It's missing certain elements and has more-than-expected amounts of others; the stone came from another geological source, but the researchers aren't sure where. The only chemical match the researchers knew of was a site in Baja California Sur, Mexico. "Just because it's a desert, doesn't mean it's empty. Israel's Negev Desert figured prominently in the ancient incense and spice trade routes, which is why it merits a place on the World Heritage list. According to UNESCO, "The four Nabatean towns of Haluza, Mamshit, Avdat and Shivta, along with associated fortresses and agricultural landscapes in the Negev Desert, are spread along routes linking them to the Mediterranean end of the incense and spice route. Together they reflect the hugely profitable trade in frankincense and myrrh from south Arabia to the Mediterranean, which flourished from the 3rd century BC until the 2nd century AD. With the vestiges of their sophisticated irrigation systems, urban constructions, forts and caravanserai, they bear witness to the way in which the harsh desert was settled for trade and agriculture." "Matseboth of different types are in abundance in the Negev & Sinai deserts. You can find them in camp sites, sanctuaries and along ancient roads. The most significant are the Matseboth installations at the tops of mountain passes." To many people, whose only thought about salt is too much consumption, it may seem an odd commodity to warrant so much effort to procure, transport, and trade. Our trucking systems today still port salt to consumers world wide. We just don't happen to find this remarkable. Neither is particularly remarkable that ancient peoples with no other access to the stuff would happily go to great lengths to trade for it. Salt is still our favorite way to cure meat. "Salt may well have been man's earliest addiction. 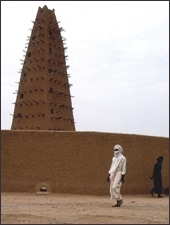 Salt drove economies, opened trade routes and settlements, even sparked bitter wars....In Niger, Tuareg caravans continue across the Tenere Desert to fetch salt from the Bilma oasis and barter millet for dates. Five milleniums since the story In Niger, Tuareg caravans continue across the Tenere Desert to fetch salt from the Bilma oasis and barter millet for dates. Five milleniums since the story of Lot's wife was first told, salt is still made in pillars and transported by camels to distant markets. This site celebrates the survival of one of the world's most ancient and fascinating cultures - The Caravans of Salt." "...archeologists have recently provided proof that the Duzdagi salt deposits, situated in the Araxes Valley in Azerbaijan, were already being exploited from the second half of the 5th millennium BC. It is therefore the most ancient exploitation of rock salt attested to date... Recent discoveries have shown that salt most probably played a predominant role in protohistoric societies, in other words those that preceded the appearance of writing....Another remarkable fact is that the abundance of artifacts dating from the early Bronze Age suggests that the Duzdagi mine was intensively exploited from as early as the 4th millennium BC. Hundreds of stone picks and hammers have in fact been found near the entrances of collapsed tunnels. The frequent presence nearby of ceramic pottery fragments specific to the culture known as "Kuro-Araxes" has made it possible to date these archeological artifacts......Such intensive extraction suggests that the salt from Duzdagi was not limited to local use by small self-sufficient communities. It was undoubtedly distributed, within a still unknown economic framework, to more far-off destinations. " 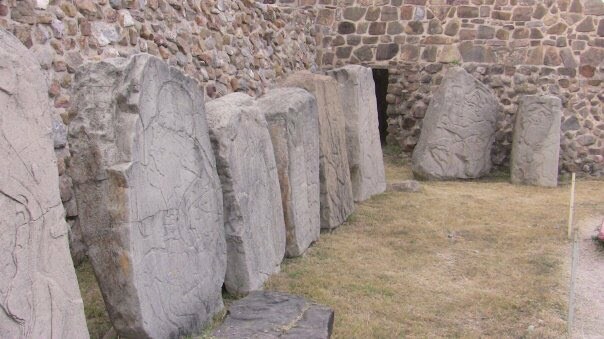 Stone Circle/Observatory in Armenia, which according to local sources, dates back to 5500 BCE. 223 basalt stones of up to 3 meters tall. 84 of them have holes. "Certainly one of the most important commodities that will never be found in an archeological context is something the entire Maya world depended upon ... salt. Without salt humans cannot survive. It is just that simple; no salt, you die. Ordinarily human populations that do not have access to a direct supply of salt can derive sufficient supplies of salt from the consumption of animals, domesticated or otherwise. In the case of the ancient Maya, however, there was a problem created by the fact that there were no domesticated animals (unless you count the turkey and the dog) in sufficient quantity to satisfy the needs of large populations. And in spite of all those Tarzan movies, there are very few animals to be had in the rain forest. The Maya residents in the highlands were especially dependent upon salt imports for their very existence." "The coconut (the fruit of the palm Cocos nucifera) is the Swiss Army knife of the plant kingdom; in one neat package it provides a high-calorie food, potable water, fiber that can be spun into rope, and a hard shell that can be turned into charcoal. What's more, until it is needed for some other purpose it serves as a handy flotation device." "What's more, coconut genetics also preserve a record of prehistoric trade routes and of the colonization of the Americas." The most obvious thing that gets shipped in the mining and trade industry is people. Chemical tests on teeth from an ancient burial near Stonehenge indicate that the person in the grave grew up around the Mediterranean Sea. The bones belong to a teenager who died 3,550 years ago and was buried with a distinctive amber necklace. The findings will be discussed at a science symposium in London to mark the 175th anniversary of the British Geological Survey (BGS). The "Boy with the Amber Necklace", as he is known to archaeologists, was found in 2005, about 5km south-east of Stonehenge on Boscombe Down. The remains of the teenager were discovered next to a Bronze Age burial mound, during roadworks for military housing. "He's around 14 or 15 years old and he's buried with this beautiful necklace," said Professor Jane Evans, head of archaeological science for the BGS. 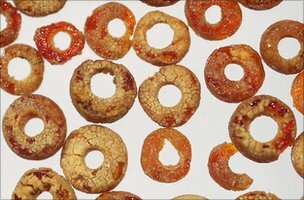 The amber to make the beads almost certainly came from the Baltic Sea. Dr Andrew Fitzpatrick, of Wessex Archaeology, backed this interpretation: "Amber necklaces are not common finds," he told BBC News. "Most archaeologists would say that when you find burials like this... people who can get these rare and exotic materials are people of some importance." "...Most rocks carry a small amount of the element strontium (Sr), and the ratio of strontium 87 and strontium 86 isotopes varies according to local geology. The isotope ratio of strontium in a person's teeth can provide information on the geological setting where that individual lived in childhood. By combining the techniques, archaeologists can gather data pointing to regions where a person may have been raised. Tests carried out several years ago on another burial known as the "Amesbury Archer " show that he was raised in a colder climate than that found in Britain. Analysis of the strontium and oxygen isotopes in his teeth showed that his most likely childhood origin was in the Alpine foothills of Germany. People were visiting Stonehenge from afar during the Bronze Age. His is a rich Copper Age or early Bronze Age burial, and contains some of the earliest gold and copper objects found in Britain. He lived about 4,300 years ago, some 800 years earlier than the Boscombe Down boy. The archer arrived at a time when metallurgy was becoming established in Britain; he was a metal worker, which meant he possessed rare skills. "We see the beginning of the Bronze Age as a period of great mobility across Europe. People, ideas, objects are all moving very fast for a century or two," said Dr Fitzpatrick. "Their findings were confirmed by a more comprehensive study published in February based on genetic tests of remains from a nearby archeological site — Xiaohe ("Small River"), which lies about 100 miles west of Loulan. Geneticists from China's Jilin and Fudan universities concluded that the ancestors of these ancient people had indeed come from Europe, possibly by way of Siberia. Nearly 4,000 years after her death, the so-called Beauty of Loulan still has the ability to amaze. 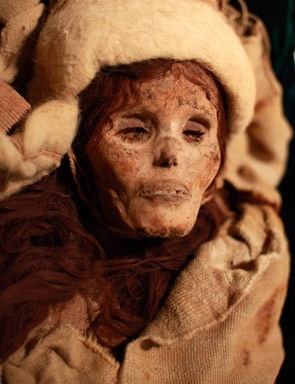 She is one of hundreds of Bronze Age mummies discovered in the shifting desert sands of northwestern China's Xinjiang region, where thousands more still lie buried. Unlike the embalmed mummies of ancient Egypt, they were preserved naturally by the elements, which in some ways makes them more interesting. They represent an extended span of history dating from 1800 BC to as recently as the Ching dynasty (1644-1912) and a range of human experience. Some were kings and warriors, others housewives and farmers.... But what was most remarkable about the corpse — believed to date to about 1,800 BC — was that she appeared to be Caucasian, with her telltale large nose, narrow jaw and reddish-brown hair. The discovery turned on its head assumptions that Caucasians didn't frequent these parts until at least a thousand years later, when trading between Europe and Asia began along the Silk Road." 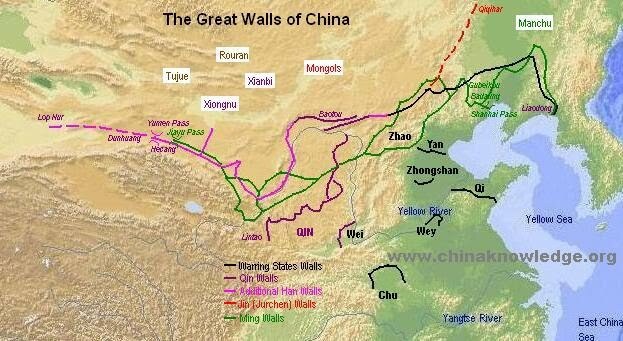 The two maps below show where the mummies were found, the map at the bottom shows the extent of the Great Wall of China. They were found near the western most most part of the wall, whch extends all the way to the sea. A tiny mountainous region in southern Siberia may have been the genetic source of the earliest Native Americans, according to new research by a University of Pennsylvania-led team of anthropologists. Lying at the intersection of what is today Russia, Mongolia, China and Kazakhstan, the region known as the Altai "is a key area because it's a place that people have been coming and going for thousands and thousands of years," said Theodore Schurr, an associate professor in Penn's Department of Anthropology.